As far as I can tell, the only thing coming from this thread is people saying "yeah, i hate those pigmen!" and you fishing for compliments. You can talk about pigmen in any other thread at any time, there doesn't need to be an "official" thread, no more than there needs to be an official thread all about creepers. No, I'd just rather there not be 100 threads about singular things to do with pigmen. ‎"Everything in moderation, including moderation." I look at them as.. well, something. They don't seem overtly disgusting, while I wouldn't want to hug it though. Indeed, the forums do need a icon for them. I need to make zombie pigmen faces! Yo, Miclee, I'm really happy for you, I'mma let you finish, but Creepers have the BEST SKINS OF ALL TIME. BUT THERE ARE, IN GRAND TOTAL, EXACTLY 293 BLOCKS OF CLAY. Real Minecraft men use Creepers to harvest Wool. I rather like creepers as well. I've been wondering, if you use TNT to kill pigmen, will they still aggro you? And would blowing up TNT via hit and run vs. redstone remote detonation make any difference? I think some of them should have bows. For variety. No, what they need is spears. Can throw as well as melee. Throwing spears and evil bull mounts. Wheres the FAQ? the back story? I DEMAND PICTURES! This is not an official thread about anything, this is you wanting people to praise you. If you want a FAQ, I need questions. If you want a backstory and pictures, I'll add them tomorrow. Okay, working on a FAQ. If you have any questions/answers you'd like to add, feel free to say. The thing is, I didn't make the thread to promote myself. 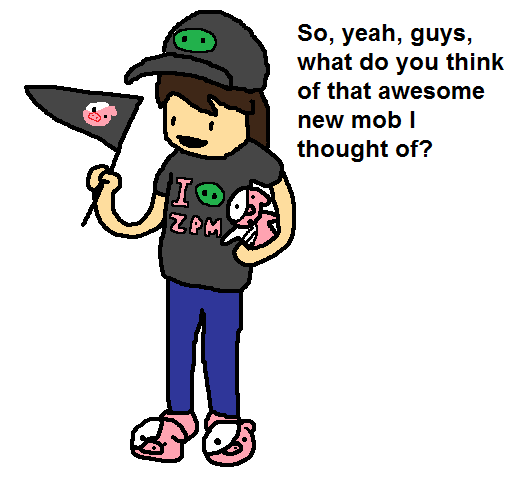 I made it so people would stop making general discussion threads about pigmen. I labelled it 'official'(and explained why it was) so that people would read it first, instead of making more threads. I really think you could have handled it better, though. Just let the chips fall where they may. You may have thought of the idea first (And note I say "may" because it's possible someone came up with a similar idea earlier, but didn't get noticed), but that doesn't mean you should feel responsible for multiple topics about ZPM any more than any other forum member is responsible for multiple fish threads. Anyway, I know it must be really exciting having your thoughts turned into a reality and shared with millions, but it really is best to be subtle. Well, I know that I thought of and suggested the idea first. Notch can confirm that much(it was pretty much the day pigs were released). Though the reason I made it is simply because the forum is too crowded with threads about them. I'd rather have the forums have more order than chaos. Well, yes, but other topics already existed. The Pigman is now out of the suggestion forum and in the game, making it the property of the Notch, and the community as a whole, meaning that the first topic to be made would be the "official" one.